From adjuncts to yeast, and from foam to chemometrics, this unique approach puts quality at its foundation, revealing how the right combination builds to a great beer. 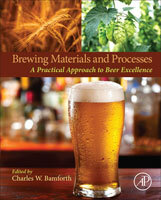 Brewing Materials and Processes: A Practical Approach to Beer Excellence presents a novel methodology on what goes into beer and the results of the process. From adjuncts to yeast, and from foam to chemometrics, this unique approach puts quality at its foundation, revealing how the right combination builds to a great beer. Based on years of both academic and industrial research and application, the book includes contributions from around the world with a shared focus on quality assurance and control. Each chapter addresses the measurement tools and approaches available, along with the nature and significance of the specifications applied. In its entirety, the book represents a comprehensive description on how to address quality performance in brewing operations. Understanding how the grain, hops, water, gases, worts, and other contributing elements establish the framework for quality is the core of ultimate quality achievement. 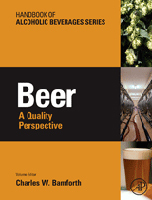 The book is ideal for users in corporate R&D, researchers, students, highly-skilled small-scale brewers, and those seeking an understanding on how the parts impact the whole in beer production, providing them with an ideal companion to complement Beer: A Quality Perspective.